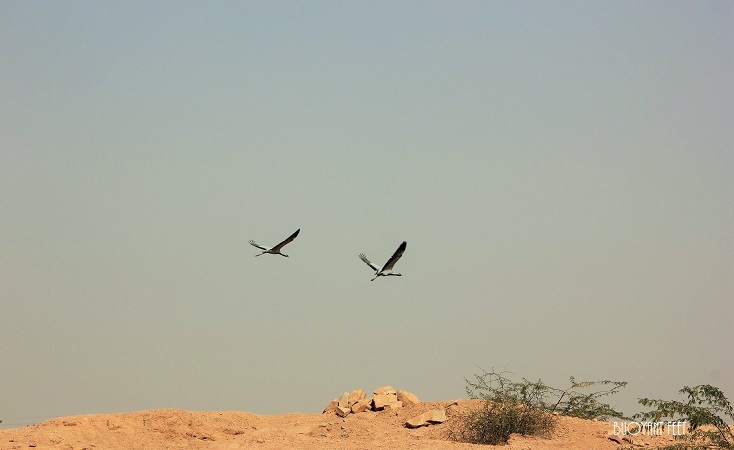 Imagine yourself standing amidst a quiet village in the desert with literally no-one around and suddenly you get to see thousands of beautiful birds flying over you. Isn’t it amazing? Something which happened with me in Khichan which left me mesmerised and enthralled. Rajasthan surely surprise me every time. I read somewhere that ‘Everything has beauty but everyone can’t see it’ and this holds true for me. Not until I visited Khichan, did I know what I had in store. 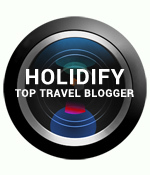 A visit to this village happened to me at the time, when it was no-where on the travellers’ wishlist. It all happened by chance when I heard a mention about it from my cab driver and opted to drop by this village on my way to Jaisalmer. 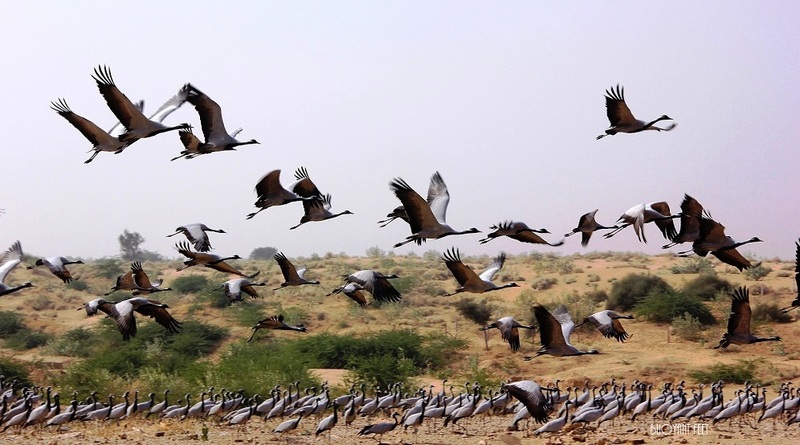 What is so remarkable about this village is the way it host around 20,000 Demoiselle Cranes that migrate from their breeding grounds on the plains and steppes of Eurasia and Mongolia. Every year the village gets filled with the energy of these Demoiselle Cranes when they fly here in August and stays till end of March. 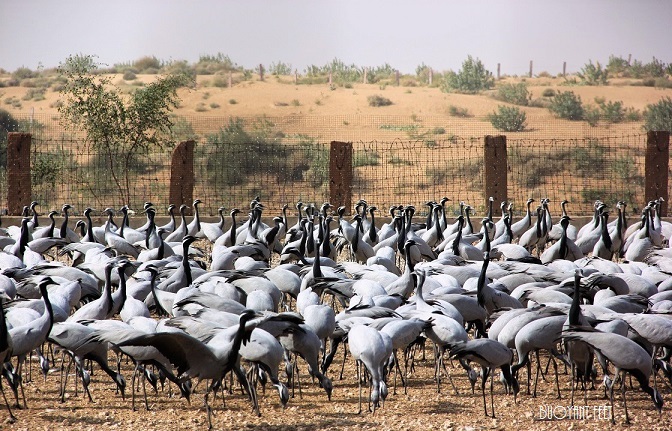 During the months when Demoiselle Cranes are at Khichan, the villagers take special care of the birds by feeding them grain in specially built enclosures or chugga ghars, and ensuring that they are safe from dogs and other predators. The spectacular scenic landscape with glimpses of Golden Sand fields on both side of the road and mirages’ forming on the highway often, will take you to Khichan. Now popular as the Village of Migrating Birds, Khichan lies at a distance of 150 KM from Jodhpur towards the northern part of Thar Desert. A popular place among the bird watchers, Khichan has also acclaimed the international recognition when it got featured in Birding World magazine. Today Iam glad that I opted to visit this place where I witnessed the unique bonding between Man and birds. Spotting Demoiselle Cranes still feels like a dream, the memory of which shall remain with me throughout my life.